The material of a shades plays a role in the light control, energy efficiency and privacy features the shade can offer. The material and color work together to unify the look of a room, making a statement about the decor and style. 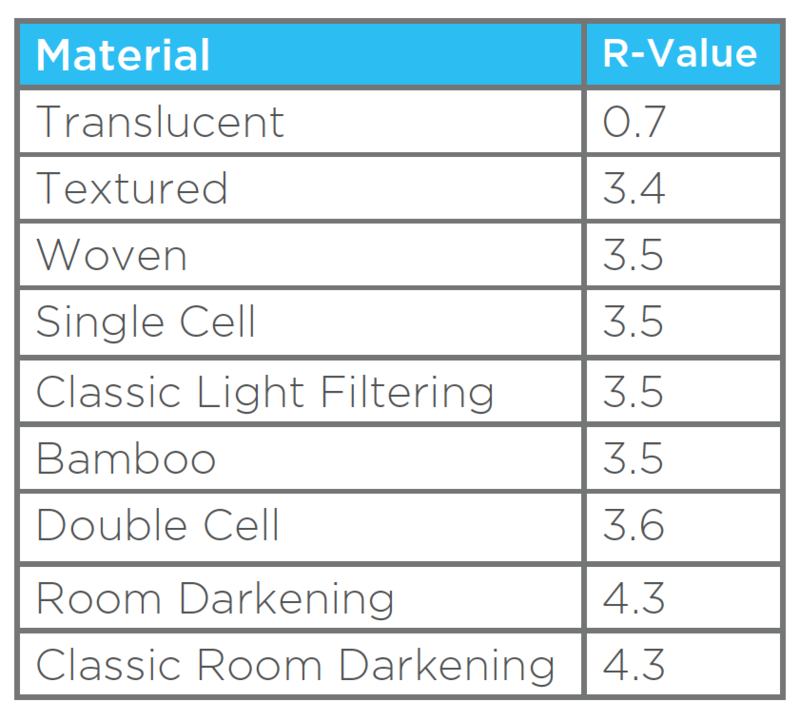 Redi Shade window shades are made with a variety of materials. Artisan Custom cellular shades are made with spunlace polyester fabric that is soft to the touch and available in a wide variety of fashionable styles and colors. The D-cell structure ensures crisp pleats that will hold their shape, while the quality materials and construction provide a premium look with long lasting durability. Translucent – A beautifully finished sheer fabric that brings modern grace to any room. The perfect accent to a bold wall color, our sheer fabric will gently filter light for dramatic effect. Woven – Create a bold statement for your windows with luxurious depth of color combined with a crisp visual texture. Perfect for rooms that require gently filtered light and eye-catching style. Textured – Slightly heavier stock, with a softly textured surface to provide a sophisticated look. Moderate light control and privacy for rooms that call for a more formal flair. 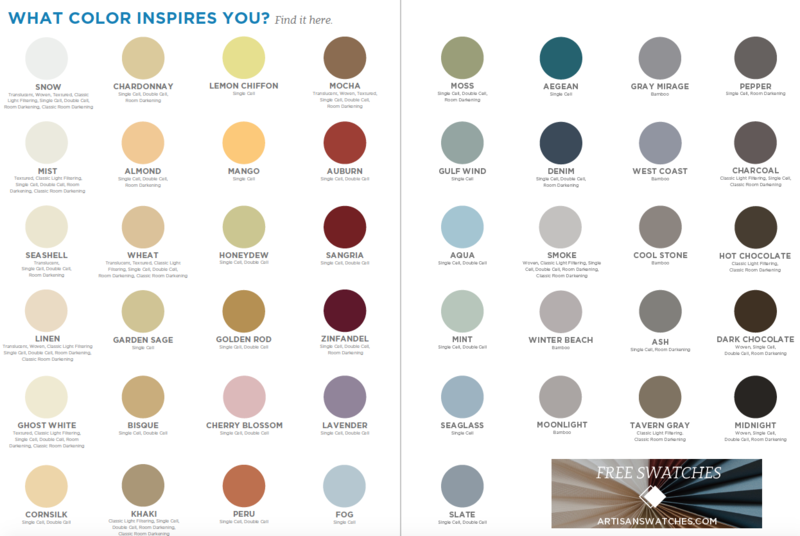 Single Cell – Durable and soft, with a wide pallet of trend-right colors for any décor. Providing moderate light control and privacy, these shades work well in any room. Double Cell – Soft double cell construction in a wide range of colors. A great choice for rooms that require increased light control, privacy and energy efficiency. Room Darkening – With striking colors from soft neutrals to deep hues, these shades provide the highest energy efficiency with maximum privacy. Sensitive sleepers, small children, and movie watchers will love the truly black room provided by these shades. Artisan Select cellular shades are made with spunlace polyester fabric that is soft to the touch and available in a wide variety of fashionable styles and colors. The D-cell structure ensures crisp pleats that will hold their shape, while the quality materials and construction provide a premium look with long lasting durability. 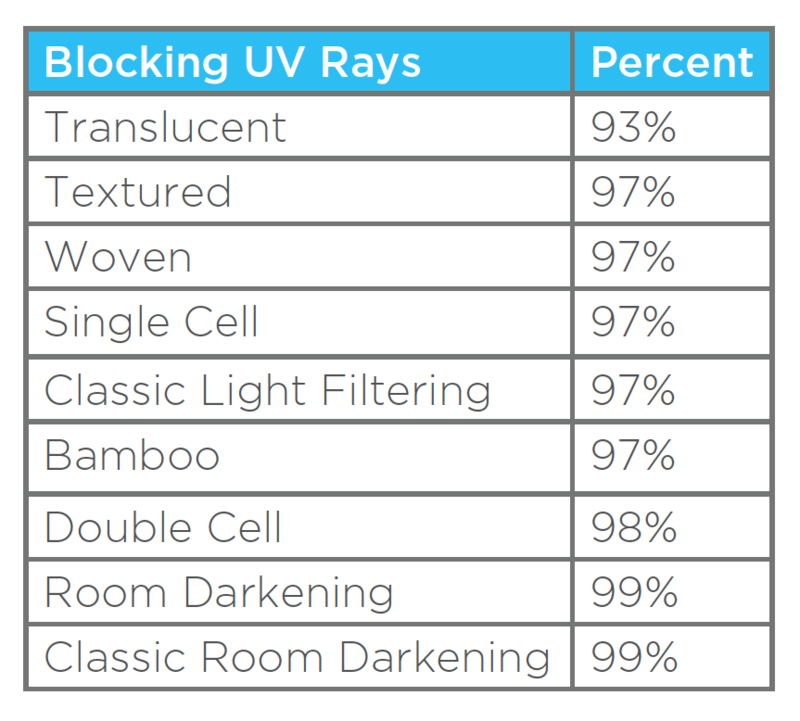 Single Cell Light Filtering – 9/16” cells, durable and soft, with a wide palette of trend-right colors for any décor. Providing moderate light control and privacy, these shades work well in any room. 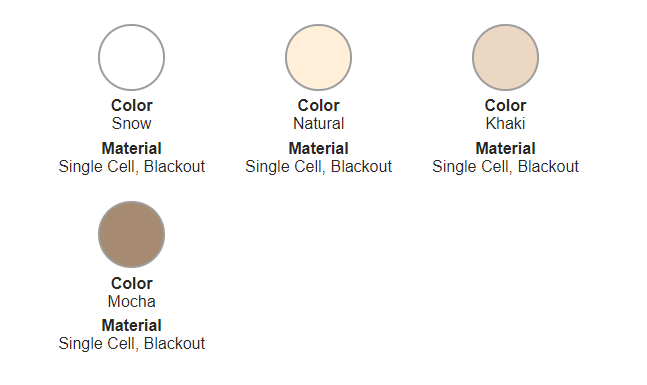 Blackout -9/16” cells, with striking colors from soft neutrals to deep hues, these shades provide the highest energy efficiency with maximum privacy. Sensitive sleepers, small children, and movie watchers will love the truly black room provided by these shades. Easy Lift shades are available in both pleated and cellular fabric to give you the custom look you want within your budget. Cellular blackout is made of 9/16” spun lace with heat reflective layer. Paper Original shades are pleated and available in light filtering, room darkening and blackout. They are made of durable paper that will not yellow and crack from sun exposure. Fabric Original shades are pleated and available in light filtering and light blocking. They are made of soft, 100% non-woven polyester. Light blocking Original fabric shades are made of non-woven polyester with a heat reflective layer that helps block heat entering through windows. Sheer View Solar shades are pleated and available in glare reducing. They are from non-woven polyester and an exclusive light blocking composite that helps you save on energy costs while keeping your daytime view and privacy. Original Arch shades are pleated and available in light filtering paper and light filtering, light blocking and sheer view fabric materials. 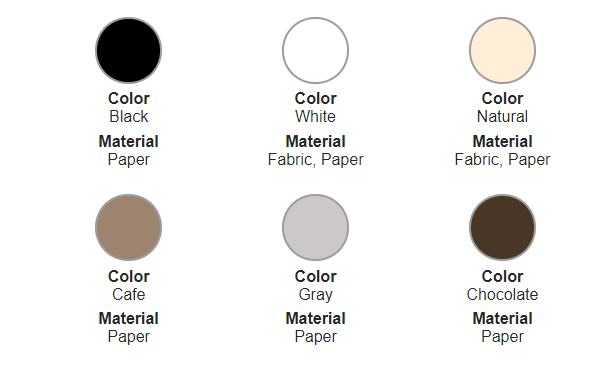 Fabric Original Arch shades are available in white and natural colors. 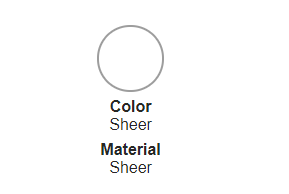 Light filtering fabric shades are made of soft, 100% non-woven polyester. Light blocking fabric shades are made of non-woven polyester with a heat reflective layer that helps block heat entering through windows. Sheer View fabric shades are glare reducing. They are made from non-woven polyester and an exclusive light blocking composite that helps you save on energy costs while keeping your daytime view and privacy. Paper Original Arch shades are white and made of durable, recyclable paper that will not yellow and crack from sun exposure.